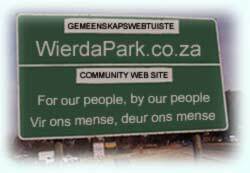 The intention of this Website is to provide a service to the community of Wierda Park (and surrounding suburbs). As you will see while browsing the menu, we intend providing a wide variety of useful and entertaining services. We will provide free basic listing of all legal and non-offensive businesses in the area, in our "blue pages". However, we will be dependent on the support of paying advertisers to help finance the costs of producing this service. To cater for all sizes of business, YOU determine what advertising on this site is worth to your business. PLEASE support our advertisers - and TELL them that you saw their ad on this Website. Then they will continue to support us and make it possible for us to continue providing this service for you. Please bear with us while we get the various services operational with initially limited content. We will obviously continuously extend the services and content. YOU can help us to concentrate our efforts on the areas that YOU tell us should be given preference, by writing to alanh@ainet.co.za. You can also help us by supplying information about Clubs,Schools, churches and businesses that we do not yet have listed, or additional information about and/or corrections to those already listed. We will appreciate being informed of any gramatical errors or spelling mistakes that you detect, please. The success of this service depends largely on YOUR participation, PLEASE. Jou advertensie kon HIER gewees het!